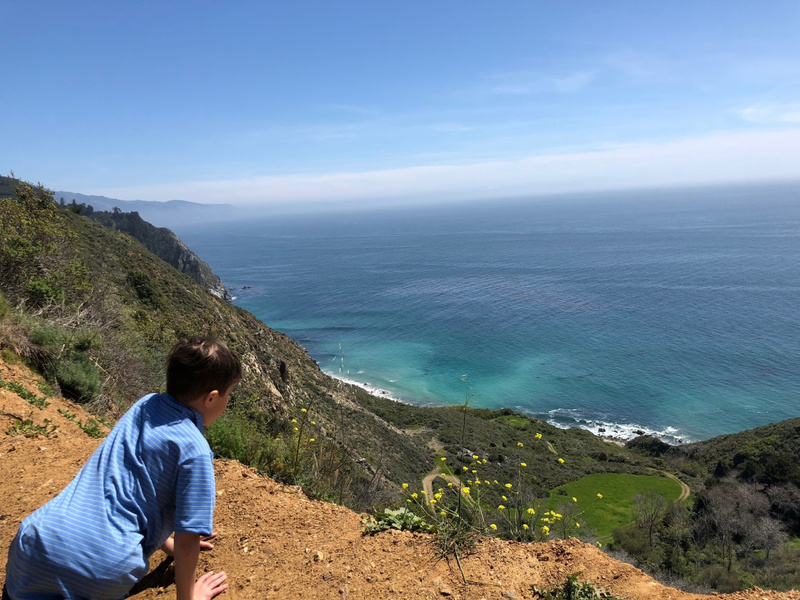 The area north of Big Sur, on Monterey Bay, was one of our favorite stops on this spring’s California family road trip. 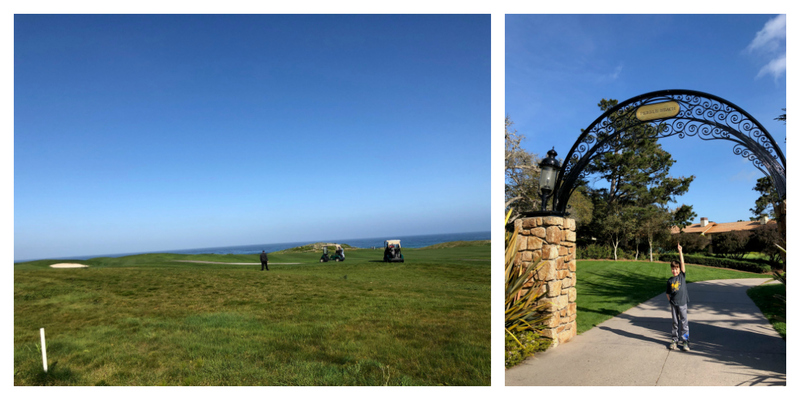 There are so many fun things to do in Carmel, Monterey and Pebble Beach. This is a popular destination for golfers and couples on a romantic getaway, but it’s also a great place for a family vacation! Pebble Beach is one of California’s most stunning coastal areas. It’s best known for the world famous golf course, but you don’t have to be a golfer to enjoy staying at Pebble Beach. Pebble Beach is actually a gated residential and resort community with access to nature trails and gorgeous beaches. If you’re not staying at a Pebble Beach property, you’ll have to pay for access to the community. This is one of the many benefits of staying on a Pebble Beach Hotel. The Inn at Spanish Bay – a romantic oceanside escape with views of the dunes and the ocean. Spacious rooms with a fireplace, plus scenic patios or balconies along the fairways. Our family of three was perfectly comfortable, although larger families would want to reserve two rooms or a suite. Fully stocked complimentary mini-bar. Soft drinks, water and snacks are refilled any time with a phone call. Snacks are key when traveling with kids! Amazing staff service level. You know you’re at a five-star hotel, with service that goes above and beyond to make your stay the best. Cash-free stay. A $28 service charge includes gratuities for the staff during your stay. When we did offer additional gratuity to the staff, they were extremely gracious and always reminded us that it wasn’t necessary. Guests of the Inn have complimentary parking anywhere in Pebble Beach so you can explore the grounds at all of the hotels and golf courses. Pebble Beach Resort has a bunch of great restaurants to choose from! We love Roy’s at Pebble Beach. This Roy’s is still owned by the original Roy and is not part of the national franchise. We love the Hawaiian-Fusion dinner menu, and the Sunday breakfast. Roy’s has an excellent breakfast buffet and the best blueberry pancakes. Included in your brunch buffet is the option to order items a la carte. Sticks is a more casual option for dinner, as it’s located right off the golf course. It’s a great place to have an appetizer and drinks while enjoying the sunset from the outdoor fire pits. 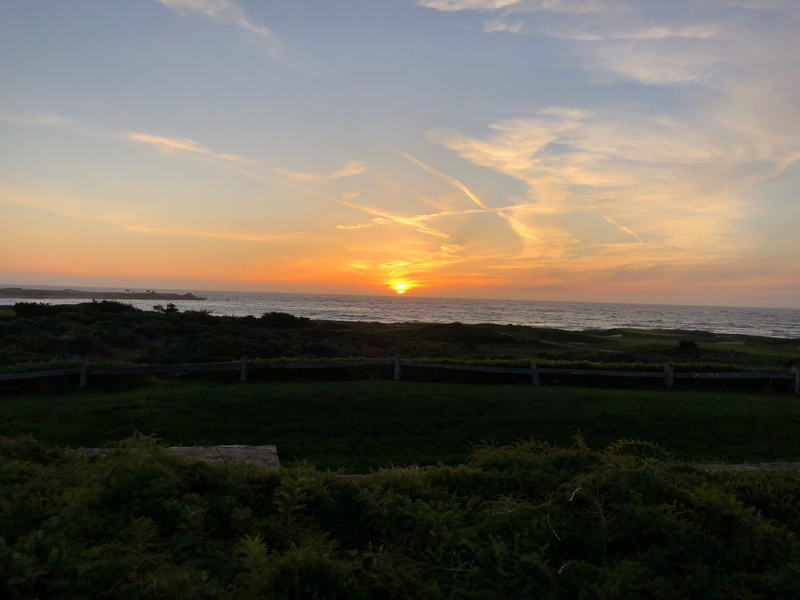 The real highlight of staying at Spanish Bay are the evening sunsets. The sunsets from the Inn are incredible. 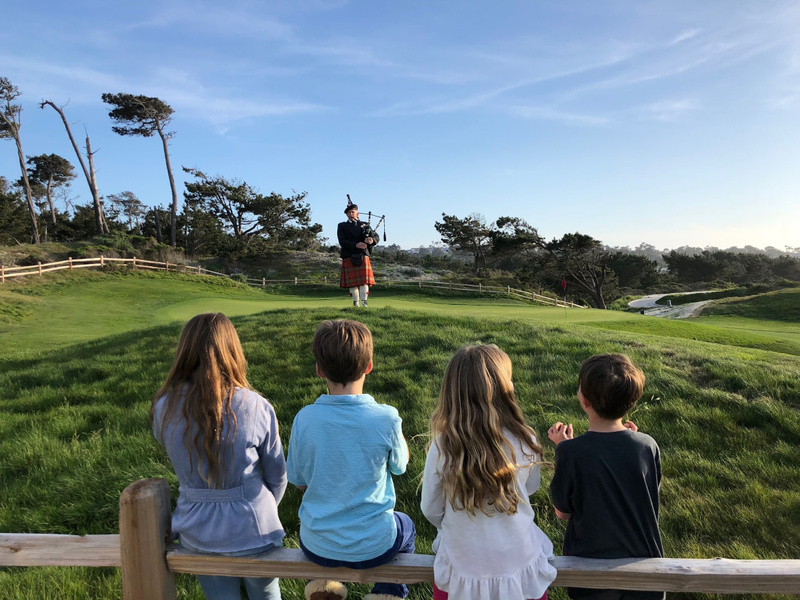 Every evening, a bagpiper performs, making his way from the fairway to the hotel lobby. It’s fun to watch the kids follow him like the Pied Piper. It’s such an amazing authentic bagpipe experience with the setting sun in the background. Don’t miss this! There is so much to do in this area, make sure you spend at least a couple of nights to explore it all. 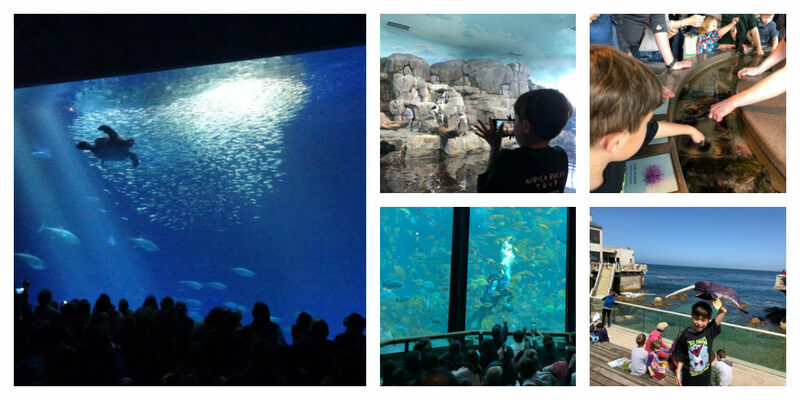 Monterey Bay Aquarium – one of the best aquariums in the world! The whole family will love exploring this aquarium that prioritizes conservation. Downtown Carmel -charming little town with beautiful water views, great restaurants and cute shopping. A fun place to go for a stroll. Monterey – After visiting the Aquarium grab lunch overlooking the water and if you’re lucky, you might spot some playful otters hanging out. Next check out the shops and grab some fun souvenirs. 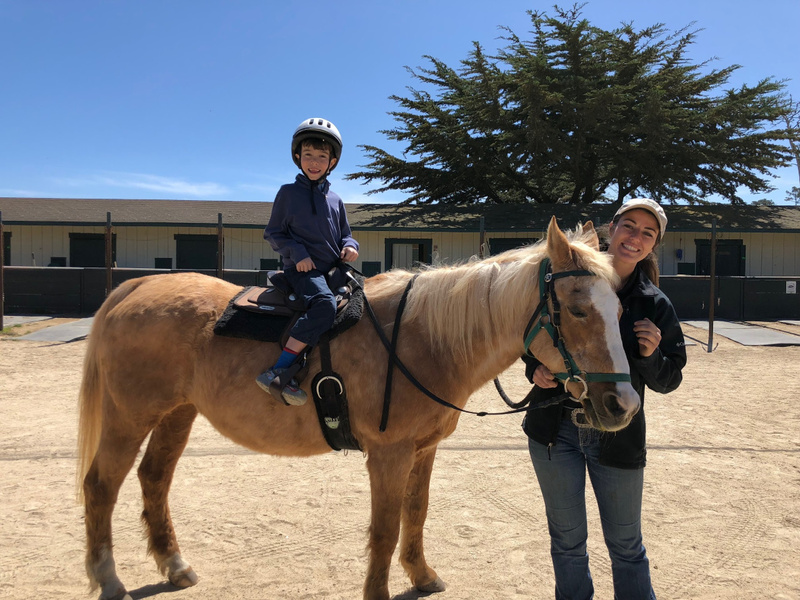 Trail Rides at Pebble Beach Equestrian Center. Harry loved his horseback trip; it was a highlight of our stay. One of the best benefits of staying in Pebble Beach is having easy access to several scenic drives along California’s central coast. The 17-Mile Drive follows the coastline of the Monterey Peninsula past amazing beaches and the famous lone cypress tree. The Inn at Spanish Bay is right along the 17-Mile Drive, so you can start in either directions for a scenic day trip. I was impressed at how much my little guy loved this drive. 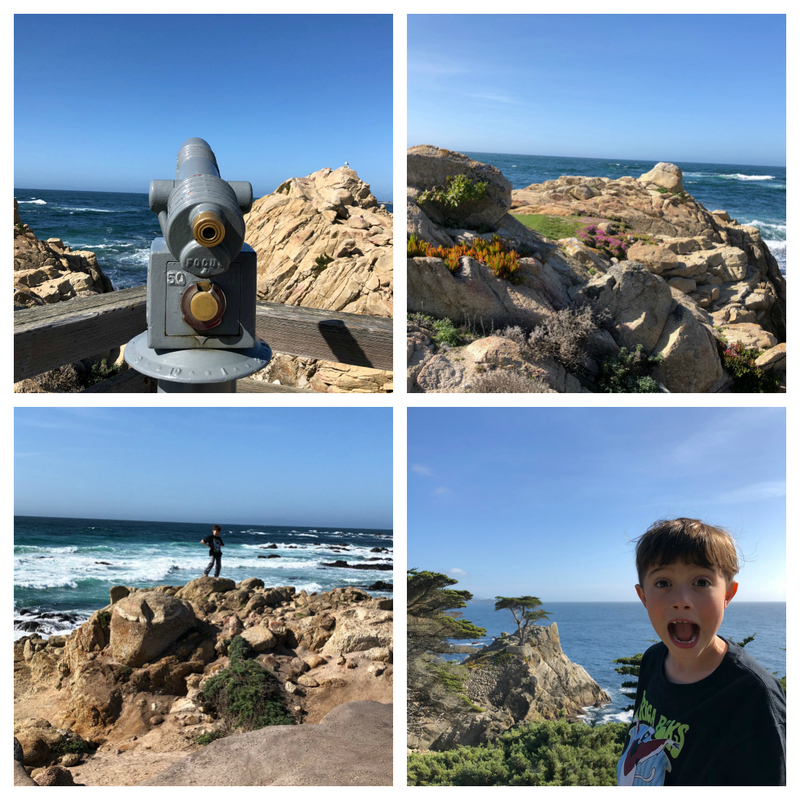 He was so excited to see the lone cypress tree and he had a blast hiking up the rocks on the beach and playing in the tidal pools. Big Sur is another famous scenic drive along this stretch of the coast. This California icon is less than an hour south of Pebble Beach. The entire drive is breathtaking and there are so many gorgeous spots to pull of and enjoy the view. Monterey, Carmel and Carmel by the Sea are all scenic drives from Pebble Beach, with cute downtown areas full of shops and restaurants. If you have more time, head to Santa Cruz to check out Henry Cowell Redwoods State Park and the Santa Cruz Boardwalk.